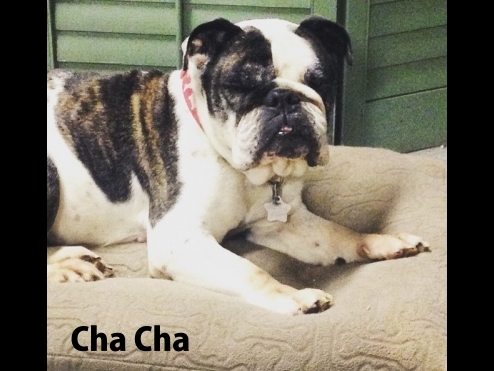 Cha Cha is a darling little girl Bulldog who is HIGH Heartworm positive and very anemic. She is a little dog who was dealt a bad hand. We tracked her microchip to a puppy broker in El Paso TX. From there she was shipped to pet store in upstate NY. Her owner then came to St. Louis and all we can assume is that his life changed dramatically. Cha Cha was found and the nice person returned her to the address on her tags, but the owner no longer lived there. She was taken to the shelter. Cha Cha was very underweight a d obviously didn't feel very well. She was tested for Heartworm and came back a high positive. With great care from her foster mom and the STLEBR famiy she gained 6 lbs (Thank you Auntie Deb for the satin balls) and she is on high iron supplements. She has completed her Doxycycline and first Heartworm shot. She has her second and third shot scheduled for the end of August. Cha Cha is a sweet and smart little Bulldog! She hustled her way into the foster mom's bed, and she likes her pug foster brothers and everyone she meets. Cha Cha still has a long way to go to get healthy, but with great care we expect her to come through with Cha Cha style!